A Welcoming Week reflection: How can we create a culture of knowing? Central to Welcoming America’s work is the idea that communities can only thrive when all are valued. We just wrapped up a successful Welcoming Week, with more than 350 events across the country where people came together to celebrate the contributions of all residents, including new Americans. We hope that many new connections were made, as people got to know their neighbors and learn more about their stories and what they have in common. This Welcoming Week, we also were grateful for the partnership of YMCA of the USA, which shares a vision with us of building more inclusive communities where new Americans and long-term residents can all thrive. Recently I overheard two young boys, about 11 years old, talking with my desk staff about an issue they were having down in the pool. I had just recently taken one of the boys on a tour with his family. They had moved to our city from Iraq. The other boy had also just joined with his family. I remember being so impressed, and also a little sad, at the way he translated everything for his mother. I came out of my office and asked the boys what was up. They told me there was another boy their age in the pool who had accused them of belonging to ISIS. This boy said he was going to join the military and go to Iraq and blow it up. I asked the boys if they would feel comfortable pointing this boy out to me and they said sure. When we arrived on the pool deck, the lifeguard was already talking to the boy about the incident. We talked about our core values and how important it was that everyone demonstrates them. We talked about safe spaces and how critical it was that the Y be one of them. He said he understood. The boys said they still wanted to swim. I cried the whole way home. As I reflect on the incident, one thing continues to resonate with me. When I was walking down stairs with the boys, one of them told me about the boy in the pool. “He knows me because when I first came here a few years ago he was in my class.” He knows me. I didn’t connect it at first. He knows him like I know the people in my Zumba class. He doesn’t know him at all. He just sees him. Our Y is an amazingly diverse population of people, but how can we create a culture of knowing and not just seeing? Share with us on Twitter your answer to this question: How can we create a culture of knowing and not just seeing? On June 12, 2016, Orlando witnessed the deadliest mass shooting by a single shooter, the deadliest incidence of violence against the LGBTQ community in US history, and the deadliest terror attack in the United States since Sept. 11, 2001. The shooting took place at Pulse nightclub, a popular gay bar that was hosting Latin night. As part of Welcoming Week, The University of Florida Center for Global Islamic Studies and the Bob Graham Center for Public Service hosted a panel discussion on Sept. 13 to discuss the Orlando shooting and give community members a chance to ask questions in an effort to process the complexity of this tragedy. The panel included Rasha Mubarak from the Council for American Islamic Relations Florida (CAIR Florida), Terry Fleming from the Pride Community Center of North Central Florida, and Zoharah Simmons, UF Professor in the Department of Religion. The panel was meant to bring together those of diverse backgrounds that were affected by the shooting in different ways and who continue to face discrimination based on their faith, sexual orientation, ethnicity and/or race. Their discussion is summarized below, and offers advice for any community to overcome fear of the other and welcome diversity. Xenophobic sentiments have been increasing in communities across the United States over the past months and the fact that the perpetrator of the Orlando shooting was a Muslim of Afghan descent produced a new wave across Florida, especially targeted at the Muslim community - children were bullied in school because of their background, a mosque was set on fire, and some tried to pit LGBT, Latino, and Muslim communities against one another. Ms. Mubarak from CAIR Florida shared her very personal experience of watching Muslim friends and neighbors be too scared to leave their houses in the days after the shooting and attendees of mosques feeling even more targeted than before. Simultaneously, residents across Florida expressed fear of Muslim community members and Muslim refugees being resettled in the state. Panelists emphasized that this fear on either side cannot be the answer. Ms. Mubarak said she and a group of other Muslim women made sure to go to the scene of the shooting and distribute water bottles and help the victims and their families to show that community support knows no boundaries defined by faith, race, or sexual orientation. Fear will divide us even further and create mistrust, which ultimately prohibits us from creating inclusive, functioning communities. Panelists also made the point that tolerance of one another should not be the way to move forward. Tolerance is too passive, unengaged, and ineffective in the process of building communities. We need to accept that we may come from different religious and cultural backgrounds, our sexual orientations may differ, and we do not need to agree on everything or expect people to share our ways of life. While tolerance is a passive approach, acceptance actively calls for individuals to get to know their neighbor, to leave their comfort zone, and learn about different ways of life, cultures, and faiths. Acceptance is not always easy, but it is absolutely crucial and truly rewarding. Panelists also provided practical advice and steps to move forward from a community tragedy, manage our own fear and the fear of others, and celebrate the diversity of our communities. Seek dialogue with others to learn about their faith, sexual orientation, ethnicity, etc. Stand Together: A toolkit for advocates, service providers, and supporters to address the backlash toward refugees and Muslim Americans, and to help you proactively engage with community leaders and neighbors. Neighbors Together: A collection of promising practices to counter anti-refugee and anti-Muslim backlash and work towards a positive vision for our communities that demonstrate how: building meaningful contact between diverse populations; positive communications strategies; and engaging civic and community leaders can help create a climate in which all people can thrive. Chicago’s ambitions to be “the most immigrant-friendly city in the world” made it a suitable setting for rich conversations about cultural heritage and inclusion at the Chicago Forum on Global Cities on June 1-3, timed perfectly with the kickoff of Immigrant Heritage Month, a nationwide celebration of our shared heritage of diverse cultures. Forum panelist Ronnie Chan, chairman of the Hong Kong-based Hang Lung Group, eloquently framed the theme at one of the Forum’s opening plenaries, reflecting on how the soul of a city is shaped by the generations of diverse people who have migrated through it. That’s certainly the case for Chicago, whose unique character comes complements of those who came here from somewhere else. Much of Chicago’s mosaic of neighborhoods—Chinatown, Greektown, Little Italy, and Ukrainian Village—still bears the names of its original ethnic inhabitants. The city’s iconic foods have immigrant roots: deep dish pizza evolved out of the culinary traditions of Neapolitan immigrants, Chicago-style hot dogs from German-born residents. Chicago is home to a slew of cultural institutions—from the National Hellenic Museum to the Polish Museum of America to the National Museum of Mexican Art—that speak to the importance of the city’s immigrant heritage on countrywide level. If cities’ souls are shaped by their past generations of immigrants, it is important to recognize that their futures—their economy and their demography—will be formed by their ability to embrace forthcoming waves of newcomers. In the Gulf States, cities are championing the building of cultural institutions as “connectivity hubs” in uniting people in countries where more than 90 percent of the population is foreign-born. Sultan Sooud Al Qassemi, an Abu Dabi-based journalist, spoke about how the city’s art museums provide a means for people from diverse cultures to converge. Experiencing each other’s art “detoxifies tensions and reinforces a shared sense of humanity,” he said. In Chile, metro-level investments in infrastructure are addressing the economic inequality that plagues the country, which disenfranchises newcomers and native Chileans alike. “My job is to convince the ‘haves’ that the problems of the ‘have-nots’ are their problems,” said Claudio Orrego, governor of the metropolitan region of Santiago. Governor Orrego has championed innovative investments in infrastructure—Santiago’s best library is in one of the city’s poorest neighborhoods, for example—to create a shared sense of ownership in the city’s future. While global cities have relatively deep pockets and large platforms to carry out their efforts, some of the most innovative work in immigrant integration is being done in smaller communities across the cash-strapped Midwest where aging populations and stagnating economies stand to benefit greatly from an influx of youthful, working-age immigrants. The Chicago Council on Global Affairs studied the incredible momentum of these regional initiatives in its 2014 “Reimaging the Midwest” paper, which highlighted the efforts of places like Detroit, Minneapolis, and Cincinnati in establishing immigrant welcoming efforts out of their mayor’s offices, and smaller communities like Grand Island, Nebraska—population 50,000—which offers citizenship classes, health fairs, translation services, and cultural awareness events to immigrants and native-born residents alike. Chicago, for its part, offers citizenship services in libraries, provides supports for undocumented students in public schools, and provides resources to immigrant entrepreneurs. Big or small, cities are filling the gaps created by stalled action on immigration at the federal level in the United States. Edward Glaeser, a faculty member at Harvard University, spoke about how “cities are good for immigrants and immigrants are good for cities” in a Forum plenary around building economic equality and vibrancy in the world’s global cities. Indeed, even as immigrants often come to cities in search of opportunity, their presence represents a demographic, economic and cultural lifeline in communities across the globe, both large and small. As global cities celebrate the unique immigrant heritage that has shaped their “souls” this month, they’d be well-served also to do some soul searching on how they can best embrace newcomers and maximize their contributions. Against a growing global rhetoric around building walls and sealing national borders, global cities can—and should—lead a constructive conversation on extending welcomes and creating strong shared futures. Sara McElmurry is the Assistant Director of Immigration at the Chicago Council on Global Affairs. Municipal ID programs are a great way for cities to break down barriers for residents and impact marginalized communities immediately in a meaningful way, while also creating lasting, positive effects for everyone. Creating a welcoming community is about more than getting to know your new American neighbors, it’s also about establishing tangible policies and practices that lead to better lives for immigrants and all residents of a community. 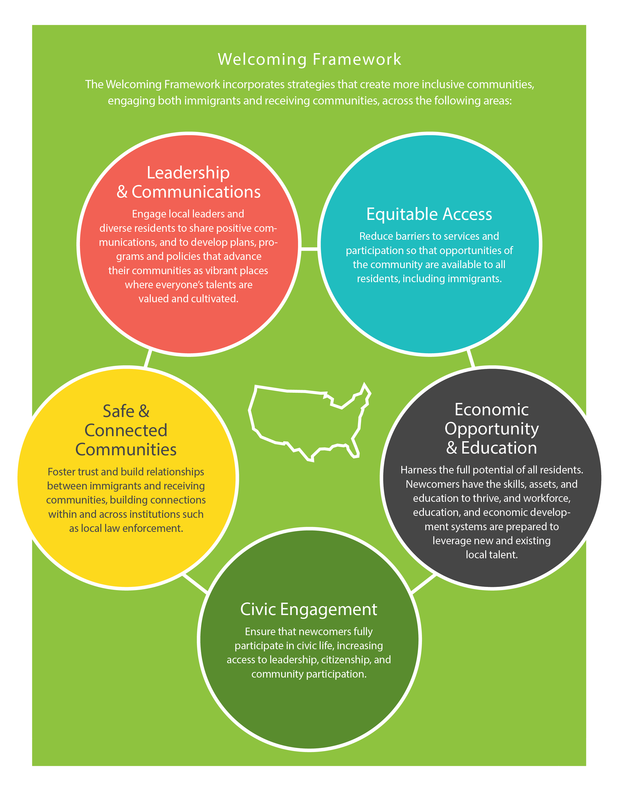 Welcoming America encourages communities to implement such practices across five strategic areas, including equitable access, which reduces barriers to services and participation. Here’s a great example of how this works in a Welcoming America community: The Detroit City Council voted in May to create a municipal identification program aimed at residents who struggle to obtain a government-issued ID – these are the residents who face the greatest barriers and include the elderly, homeless, and immigrants. The program will reduce barriers to participation for 12,000+ Detroit residents that lack such a document and therefore the opportunity to do things like open a bank account or cash a paycheck – things that contribute to full participation in community life as well as family and economic prosperity for the community as a whole. "This really honors a basic human right of being recognized in society," said City Councilwoman Raquel Castaneda-Lopez. Q: What impact do you hope to see in Detroit from this new initiative? A: We hope that this card will help enable access to city services for all Detroit residents, which will including law enforcement, and private services and resources where residents might otherwise face challenges because of a lack of ID. We hope this card will empower impacted residents to be more active members of the city and society and allow them to interact with and Detroit without facing barriers. Q: What has been the response thus far from community members? A: The community is very supportive and excited for the IDs. During public hearings for the Council Committee Meeting and Council Meeting, the room was full of residents who came to testify in support of the ID. A number of testimonies included heartfelt stories of moms and children who faced challenges in picking up children from schools, accessing library resources, and other day-to-day level challenges in interacting with city officials just because of a lack of an ID. Q: Tell us about getting the measure passed in city council – how did you work through this process and challenges; how did you address people’s fears to get them on board? I imagine there must have been some fierce backlash to giving voice to some of these folks, like undocumented immigrants. Other Welcoming America communities likely face similar issues, and your advice could be very beneficial. A: We are very lucky to have Councilwoman Raquel Castaneda-Lopez, who sponsored the bill. She took the lead on engaging with each city council person directly to discuss the ordinance and what it means for Detroit residents. She made sure to highlight the different communities that can benefit from municipal ID, such as seniors, youth, homeless, and returning citizens, which helped show the broader impact and effect this program can have for many Detroit residents. She had one-on-one meetings and ensured that she answered everyone's concerns about the IDs. Due to her efforts, the ordinance passed unanimously! Q: How does giving voice to all members of a community make the entire community stronger? A: Communities are stronger when all members are participating. Giving voice to everyone contributes to a community across several areas - to public safety because people report crimes; to economic development because more businesses are opened, homes bought, and taxes paid; and to cohesive neighborhoods where neighbors interact and know each other. These are only some examples of what it does, and we believe the municipal ID program will contribute to building a stronger city. The municipal ID program also is a great way for cities to break down barriers for residents and impact marginalized communities immediately in a meaningful way, while also building a long-term program with lasting effects. Read more about Detroit’s new initiative. Donna Davis, Emily Hackerson, and Zessna Garcia-Rios from The Cisneros Center for New Americans at Welcoming Interactive 2016. This is only the second conference I've attended in the rising field of immigrant integration, but I had the distinct sense of being amidst familiar and friendly folk this past week in Atlanta, as if it were a reunion of our 200 closest and most diverse friends and family. For three days, the Cisneros Center Fellows and Research and Evaluation Specialist attended the Welcoming Interactive 2016 in Atlanta, Georgia, hosted by Welcoming America. The term "Interactive" implies a less traditional conference, where you generally listen to experts on panels and iron out your professional clothes. This gathering didn't have a panel in sight, but boasted round-table discussions, team learning activities and even group morning stretches to get the ideas flowing. Representatives from numerous states and several countries rallied to share and learn from international perspectives on creating more welcoming communities. While I could speak to the many lessons learned and ideas sprung from rooms of experience offered up by academics, practitioners, teachers and students, what struck me most was the tenor of this conference. Below the hard facts and tough realities of many elements of this work, there are hundreds of hard working and courageous people who bring to their communities unrivaled amounts of heart. Non-profit work generally gives one the joy of knowing she is working towards an acknowledged ideal, but the field of immigrant integration strikes me as having the added challenge and beauty of trying to change the culture and conception around change. We're practitioners who praise change, but also must teach and show its benefits to our communities, friends and colleagues. In her opening remarks, author Isabel Wilkerson said, "the laws can only take you so far if the heart isn't willing to follow." She was referring to the unutterable barriers African Americans faced before and during their years of Great Migration from the south to the north of the United States in the early 20th century. However, her words echo into our work now; we can make all the progressive laws we want that empower new Americans, but we must work even harder to change hearts. Zessna and I ended our final day in Atlanta at the Martin Luther King Jr. National Historic Site, sitting on the front steps of Dr. King's childhood home. We watched rain clouds shift rapidly towards the metro skyline jutting up just beyond the preserved spaces of civil rights history on Auburn Ave. It was getting late, rush hour traffic barked at us from a short distance, and we felt ready to go home. If anyone could send us off with a final lesson in heart, it was that great city of change and that great leader of love. Emily Hackerson is an American Dreams Fellow at the Cisneros Center for New Americans.